As we gear up for the launch of the new Virgin Atlantic Upper Class seat next Monday, Virgin has rolled out five new “Flying Icons” to adorn its new A350-1000 fleet. These will replace the traditional Flying Lady image. The icons, covering a mix of genders, races and orientations, are designed to be more representative of modern Britain and will be rolled out on four new A350-1000 aircraft this year, followed by a further eight by 2021. Virgin Atlantic’s original use of the Flying Lady was inspired by the figureheads that have traditionally decorated ships. The original design was apparently based on Alberto Vargas’s images of pin up girls from the 1930s and 1940s. 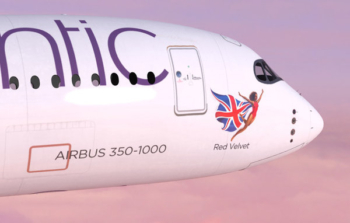 Here is a mocked up image, click to enlarge, on an aircraft to be named Red Velvet. You can see all five new icons in this 15-second YouTube video. A couple of days ago we covered a very attractive Qatar Airways business class deal from Stockholm to Bangkok. It is £1300 return, earns you 560 British Airways tier points and is available virtually every Monday to Thursdsay in 2019 apart from Christmas week. It seems that there is a similar fare on Qatar Airways from Stockholm to Hong Kong. A return Business Class seat comes in at SEK 15,460 (£1,260). A350-900 – the herringbone seat which I reviewed here, albeit in its 787 incarnation, which is very impressive. Qatar has a special website showing off this seat which you’ll find here. Some A350-900 aircraft also have Qsuite. The Boeing 787-9 and A350-900 seat is very close to the same seat as you will get with the new British Airways Club Suite, albeit without the door. 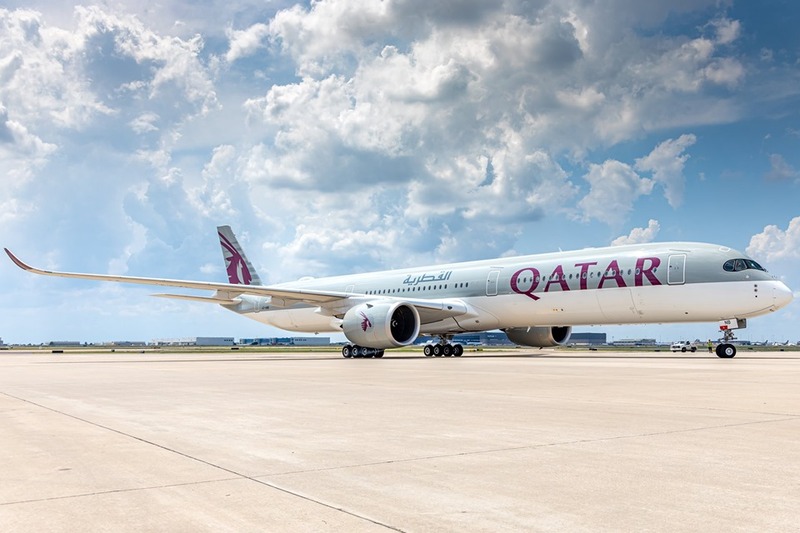 The Qatar Airways booking site is here. You need to book by 30th April and a five day minimum stay is required. Le Club AccorHotels has launched a generous promotion if you are prepared to book your next stay in advance. You don’t even need to book too far ahead (book in April and stay in April is possible) but for the best result you need to book now for August stays. As far as I can tell – and make your own judgement based on the terms and conditions – you do NOT need to book a pre-paid rate. That is a total of 11.9 Accor points, worth 23.8 Eurocents, per €1 spent. On a pricey trip this could be very lucrative. Alternatively, convert to Iberia Plus Avios (do not convert to BA as the conversion rate is worse) and you’d be earning 11.9 Avios per €1. Don’t forget to register before booking (existing bookings will not count) via this page. OT – is BA F on the 777 or 787 better? Depends what you think of the seat. I think it’s the crew which makes the most difference and that’s the luck of the draw. I guess the 787 is a bit more private if that’s your thing. That said my O/H thinks the 787 is a bit claustrophobic. It’s subjective. First class is better on the 787, as the seats are newer, the TV screen is better quality and larger. Also, since there are only 8 seats, it feels more private and exclusive, compared to 14 on the 777. It’s more enjoyable on the 787. I agree. Much prefer the “newer” 787 seat. However your trade off is the loss of the buddy dining option which might be significant if you are travelling as a couple. I just flew the 787 to KL. seat was comfy but as I am 6’4 I found the leg well restrictive. You will certainly feel less jet lagged on the 787 though and IMO it is much quieter. Moot point – but F on the 380 trumps all….far far better…..777 F is starting to get a little tired IMHO…787 is definitely nicer! How does Le Club Accor deal with existing bookings? Do I need to book a new room for June and cancel my existing booking, or will simply registering mean that my existing booking counts? It’s usually new bookings only with Accor. Failing, chaotic, laughing stock, intolerant, divided. I got the Qatar £1300 Stockholm to Bangkok return fare flying out and returning on a Saturday next February. Regarding the Qatar flights: Do I just enter my BAEC number in the booking to get the 560 tier points and avios? Or do I need to join Qmiles? There’ll be an option to credit the flight to QMiles or BAEC. Once you select the latter you can’t enter your number when prompted. I don’t think Qatar had any 787-9s? Only 787-8s. Slightly OT but related to VS, BBC are reporting Flybe have cancelled at least 24 flights. OT- quick query. Through quirk of scheduling I have 9 Hilton stays booked between end of July and start of October. I don’t usually stay too much at Hilton properties but am a Amex Plat Hilton Gold. My thinking is to request a status challenge mid-July to my IHG Spire status. Will my existing reservations count towards the 8 stay target I’m expecting to get. Or will I need an additional 8? Yes, they will. but remember to ensure you have had a recent IHG stay at time of request. I do. That’s great thanks. You’ll be fine, and you’ll have Diamond till March 2021. I matched from Marriott Platinum Premier (now called Titanium!) last year. You’ll get a lot of joy out of Diamond status if you stay at Conrads in Asia, for example; for North America, probably not so much. I would have thought that the paintings were copied from the cartoons on US Navy and Army Air Force planes from WW2. I always thought these, the hot red uniform etc that Virgin created the same sort of glamour not of the hey day of flying, but of a failed page 3 glamour model. Not class, just crass. My poor wording: I was referring to the practice of painting lovely ladies etc. on aircraft noses rather than the actual picture. Was probably before WW2 and Marines too. Are there any other ex-EU routes with decent Qatar fares to Bangkok? Ideally I’m looking for a fare from France. Have a play around on Google Flights or ITA Matrix. Sofia had some good deals recently. Across most chains, the general rule is that you’d get 2 days doubled – but see if the T&C’s say ‘stays must be completed’ by 31st August or not.